Popular for several decades, open plan living helps to further the design idea that less is more. Rather than relying on walls, architects can create living spaces that can include elements of kitchen, living room and dining area, while still supporting additional floors. Interior design concepts like an open plan kitchen / living room extension are influenced by the Scandinavian style. Creating a contemporary look, this minimal approach keeps furniture and clutter to a minimum. Open plan homes take this even further, removing unnecessary walls, and providing a space where the whole family can be together. There are a number of things you can do to create an open plan house, helping your space seem much lighter as a result. What makes an interior design open plan? Open plan designs are typically defined by the reduced number of supporting walls. Additional floors are supported by other methods such as hidden steel beams. Architects are becoming increasingly savvy at creating the perfect open plan living space. Extensions can expand an additional room, or alternatively spaces can be merged such as from a kitchen to dining or living room. Upstairs, this could be as simple as an en-suite bathroom with a larger door space, or creating a single master bedroom rather than a couple of smaller ones. Open plans allow for better air circulation, as there are less walls to block the movement of any breeze or air flow. The idea is to keep the space as open as possible, so try not to fill the space with extra furniture. What difference could an open plan living space have in my home? Convenience – Perfect as living spaces for families, letting you carry out different tasks, all in the same area. Style – Helping to create more of a more contemporary design, irrespective of the property’s age. Easy to clean – For a start, with less walls, there are less corners to hoover! Lighter – Helping to get an airy, spacious and well-lit space that can work particularly well for smaller homes. Drafts – Increased air flow means that any drafts can easily circulate in your home, making it feel colder. Cold – As well as drafts, larger spaces take longer to heat up. Noisier – With lots of activity all in the same room, it can quickly become difficult to hear what is going on! Not flexible – It isn’t simple to change with an open plan, as removing walls is a permanent decision. Installing folding room dividers could make your space a lot more suited to your changing needs. Are you looking for other small open plan living room ideas? There are many open plan design options for your property, above and beyond simply reducing the number of walls. It can be easy to be overwhelmed by numerous designs and possibilities for your home, but with a little imagination, you can instantly transform your home. Light – Specifically lots of light – Opening out your home makes it feel lighter, and while sunlight plays a part, spotlights or skylights can also make your space feel much larger. Larger (or more) windows – Many of the open plan designs found online feature a large glass wall at one end. In summer months this can easily become too bright, and may not be safe for the area you live, so it is worth thinking about how best to control the light, with options such as tracked plantation shutters. Flooring – For the open-spaced Scandinavian style, flooring should be consistent, with choices such as wooden floorboards, marble and tiles. In kitchens/dining areas it would make sense not to use carpets. Cupboards – Less is more with some interiors, although it is important to remember to find space for appliances such as vacuum cleaners, mops and buckets. Built-in cupboards can be perfect for this. Room dividers – Perfect for providing more flexibility, interior folding sliding doors can be stored out of the way most of the time, while giving you the option to partition your open plan when required. Where can I get doors made? A joiner would be an obvious choice for getting made to measure internal doors. However, it can be an expensive option for large installations, like dividing a room. However, with free home appointments and no obligation quotes, your local Shuttercraft would also be a good point of call. With experienced design advice, and the attention to detail you only get from a trusted local expert, they would be ideally suited to helping you find the right divider doors. Wondering if your room divider doors will be cut to size? 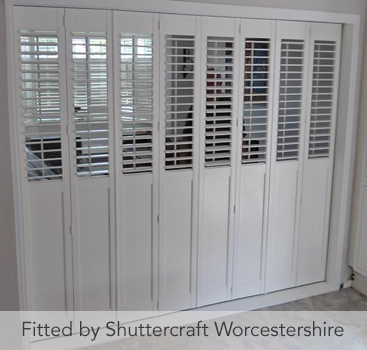 Rather than pre-packaged goods that are then trimmed down, Shuttercraft only fit shutters that are made to measure, and crafted just for you. We pride ourselves on our installations just as much as the products themselves. While actual doors may be sturdier, louvred track shutters are a lighter choice for dividing up your open plan home. They can also be matched to any existing window shutters you may have to provide a consistent look and feel throughout your property. 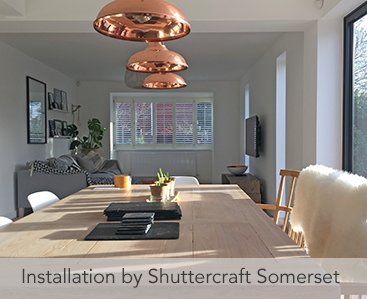 Your nearest Shuttercraft also offers a colour match option for almost all its shutter ranges (with the exception of Antigua), so you can rest assured that the colour can match your design ideas. Track system shutters can help close up a kitchen by partitioning off space when required. They can fold out of the way, providing easy access throughout the open plan area. They reduce air flow when closed, and limit the volume of condensation spreading through your home. Made to measure room dividers suit a range of interior designs, and having them installed on shutter tracks makes their operation as smooth as possible. Although useful as room dividers in open plan spaces, track shutters can also be used for covering patio doors, large windows and as made to measure cupboard doors. Shutters on a track also benefit homes with en-suite bathrooms. They help keep the room ventilated due to the louvres, and easily bi-fold out of the way when you’re finished bathing. 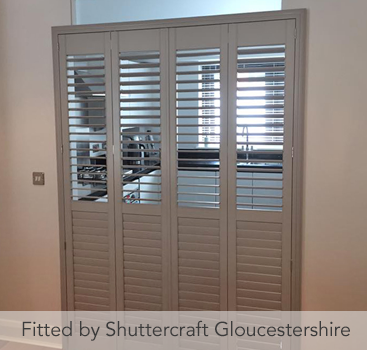 If you have an open plan space and want to find out how to better use the space, why not speak to a Shuttercraft in your area to discuss options about tracked shutters as room dividers. Providing insulation against heat loss, shutters are an obvious choice to split up your room when required, helping to keep your home warmer during the winter months. Book a free home survey today, with no obligation to buy, and discover the benefits of choosing shutters for your home – not just in terms of practicality, light control and insulation, but also in helping provide more privacy. Room divider shutters help make the most of your open plan home. Should you need to keep your home warmer (or quieter), shutters are an ideal solution. Contact your local Shuttercraft today to find out more! If you found this article of interest why not read more here.